A studio and stage guitar owned by George Harrison and also played by John Lennon is going up for bids in May. 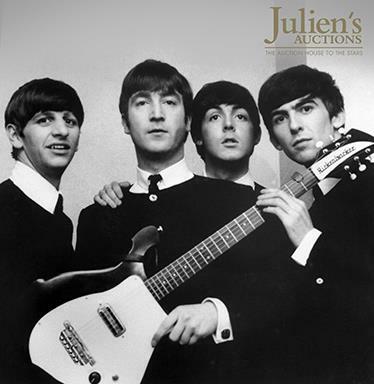 The 1962 Rickenbacker played during the sessions that produced I Want To Hold Your Hand and in early concerts and TV appearances by the Beatles is the center piece of a May 16 & 17 auction Julien's Auctions will conduct at the Hard Rock Cafe in Times Square. Other big ticket items in the online and on-site sale include the first guitar Jimi Hendrix owned, a jump suit Elvis Presley wore on stage and an assortment of items that belonged to Michael Jackson.